From terrific templates to beautiful buttons and badges to illuminating icons and illustrated characters, e-learning pros love to get their hands on gorgeous graphics—especially when they’re free. And thankfully, you don’t need to be an image editing whiz to make the most of free graphics for your courses. Whether you’re creating courses in Articulate Storyline or Articulate Studio, these six easy editing tricks will have you customizing your free graphics finds in no time. Not sure what file types are best for your needs? Get the low-down on working with all different types of graphics with this helpful primer from Nicole Legault. No photo editing software? No worries! Editing free vector images in PowerPoint is a snap with these easy-to-follow pointers from Tom Kuhlmann. Looking for a more robust image editing tool than PowerPoint? Mike Taylor offered up some budget-friendly alternatives in this helpful article. Need to trick out your .jpgs? Many images, especially photos, are usually .jpg files. Check out these 6 helpful tips for customizing .jpgs in Storyline, courtesy of Nicole Legault. Want to turn your free icons into buttons? Use this sweet trick from Tom Kuhlmann to quickly create custom buttons using Storyline’s shapes and format painter. Like the clean and simple line art style of our Fall of Freebies giveaways? You can create dozens of custom characters that mimic this same style by following this easy 3-step process from Tom Kuhlmann. Working with graphics not your forté? No problem, we’ve got you covered there, too. Grab our free eBook, Essential Guide to Visual Design to get a crash course on the basics of graphic design that’ll have you cranking out pro-style courses in no time. 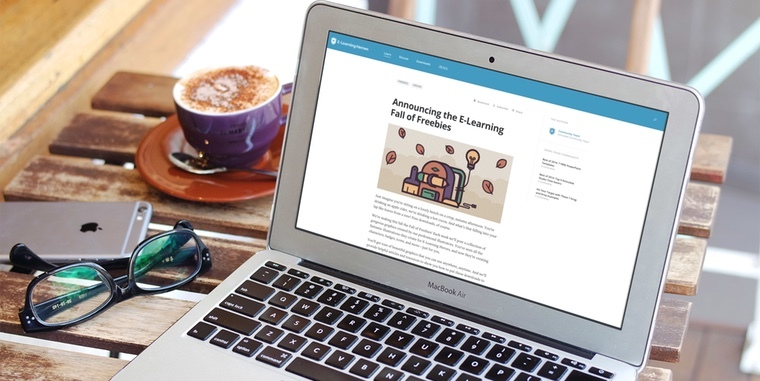 And if you haven’t already, follow Articulate on Twitter or come back and see us on E-Learning Heroes where we regularly share helpful e-learning advice—and oodles of free goodies.